The whirl-wind activities of the holidays and all the great guests we had at our Sandwich Bed and Breakfast distracted me from my wine blogging duties. For me the opportunities for formal wine tastings diminish over the winter months as we focus on repairs and improvements to the Inn and take some much needed time off. Jan's and my life plan includes our annual Motor Coach trip to Florida to visit friends and family and recharge are batteries. Many of our guests have seen our Winnebago Aspect parked in the driveway and have heard stories from our travels. On a recent stay at the Salt Springs Campgrounds in Ocala National Forest in Florida, we had an accidental wine tasting. It probably will not surprise past guests from our Inn that we quickly acquainted ourselves with other campers and invited them over for ‘cocktails’ and snacks. Jack and Pat from Vermont and Ed and Margie from upper Michigan pulled up their chairs for a little conversation and libation before we all went to the live entertainment scheduled at the ‘Barn’. As you might suspect, I do not like to be too far from great wines. 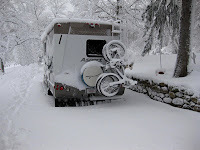 Over our years of RVing, I have taken safeguards to assure I have access to fine wines no matter how remote or rustic our camping environment may be. I have worked out special storage arrangement to guarantee I have some of my favorites with me at all times. From my mobile cellar, we started with a Ceja 2007 Pinot Noir, which I am sure no one had ever had before. Jan and I discovered the Ceja Vineyard on our last winter trip to California where we visited many wineries to improve our knowledge, expand our pallets, and find wines for our Inn. We met the Ceja family, Amelia, Pedro, Armando and Martha, and fell in love with their red wines. With limited production and distribution, we are please when we can share these great wines, which are seldom available outside on Napa Valley. I next served a Joseph Carr Wine’s 2005 Cabernet Sauvignon, a wine I have enjoyed many times and about which I have blogged before. Just last summer, I tasted the 2008 Cab with Joseph Carr himself at a wine tasting sponsored by my friends from Cellar 55 Wine Merchants. Joseph’s wine is a nice Bordeaux style blend that has low tannins and is very approachable/drinkable, even when young. I think the 2005s are drinking perfectly and my camping friends seemed to really enjoy it. After the wonderful wine, we moved on to the live entertainment at the campgrounds’ community center, which is literally a barn. 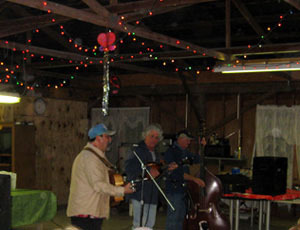 This Saturday night the venue presented a bluegrass trio called ‘The New Old Daze’. The music from the stand-up bass, guitar, and mandolin was infectious. It reminded me of the sound track from that 2000 cult film, ‘O Brother, Where Art Thou’, about three haphazard depression era prison escapees lead by George Clooney. Although the Barn could be straight out of the movie, no one would confuse the band members with George or his singing. After an interesting night at the Barn, we finished off the night with a little dark chocolate and Zinfandel. A glass of the 2008 Orin Swift Cellars Saldo Zinfandel was perfect with our Ghirardelli Intense Dark Sea Salt Soiree. This was my first taste of this big, lush Rutherford, CA zin. I am a big fan of Orin Swift Cellars ‘Prisoner’, a wonderful zinfandel blend, but will now be looking to stock Saldo as my new favorite California Zinfandel. Even if you are camping in the wilderness, there is no excuse for not having a great wine to share with your fellow travelers.